FRANKFURT -- Opel is in talks with workers to cut their hours at its main Ruesselsheim plant in response to weakening demand for cars in Europe. The automaker could seek government subsidies to compensate employees' lost wages. GM lost $747 million on its European operations last year as a weak economy hit car sales in the region, forcing carmakers to confront high fixed costs and excess production capacity. The "deteriorating market situation in Europe" had led it to negotiations with the works council and labor union IG Metall over reduced working hours, Opel said in a statement on Thursday, confirming an earlier newspaper report. The General Motors subsidiary said it expected to conclude talks shortly for shortened working hours in Ruesselsheim, where it makes the Insignia mid-sized and Astra compact cars. Of almost 14,000 people who work for Opel in Ruesselsheim, the 3,500 factory workers are likely to be most affected. A spokesman said it was not yet clear how working hours could be reduced in administrative jobs. German daily Allgemeine Zeitung Mainz earlier cited company sources as saying Opel was also considering shortened working hours at its engine factory in Kaiserslautern, Germany. That plant has 2,500 workers. Opel did not confirm that information. The works council in Ruesselsheim declined to comment on the matter. IG Metall was not immediately available for comment. Opel has production plants in Ruesselsheim, Bochum, Kaiserslautern and Eisenach, Germany. business plan, which runs through 2016, in a step toward returning to profitability. But real savings in a restructuring will not come until GM negotiates a deal with labor unions to close Opel's plant in Bochum, Germany, after 2016. Capacity utilization at the Bochum plant is relatively high thanks to the popularity of the profitable and strong-selling Zafira minivan. Opel has no plans to shorten working hours in Eisenach, where it makes the Corsa subcompact. If management and labor agree to shorten working hours at the Ruesselsheim factory, Opel can apply for subsidies under the German government's short-work program, called Kurzarbeit in German. The scheme was used by many struggling companies in the 2008-2009 recession, allowing them to preserve jobs by cutting employees' hours when plant usage was low and having the government compensate workers for part of their lost wages. The government pays workers in the program 60 percent of their net lost wages for up to six months, or 67 percent if they have children. At the height of the global financial crisis, more than 1.4 million workers in Germany received money under the program. That figure stood at about 80,000 in May, but several companies have had to seek subsidies in recent months. U.S. automaker Ford applied for shortened working hours at its German plant in Cologne in April. Ford also has been hit by a slump in demand for cars, particularly in southern Europe. 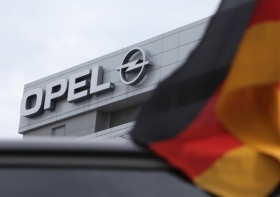 Opel has not yet filed an application but has requested a meeting with the head of the labor office to discuss shortened working hours, a spokeswoman for the office said. In the first six months, sales at Opel and UK-based sister brand Vauxhall fell 15 percent to 467,937 in the EU and EFTA countries, according to data from industry association ACEA.